Taskworks is owned and operated by Greg and Rose. Greg is a mechanical engineer and Rose a Secondary Maths/Science Teacher. Both their skills were utilised to start the business and it took a number of years of planning and hard work to develop Taskworks. 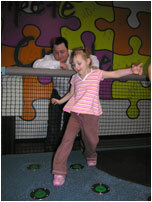 We aim to make Taskworks a safe, hands-on and fun experience where children and adults can play and learn together. The concept behind this unque activity center came about from a real concern for children becoming more insular in their play, in many instances spending too much time watching TV or in front of computer screens. Taskworks was developed to provide kids with an environment in which they could 'get back to basics' - talk and work with each other and use their bodies and their minds in different activities. Taskworks motto is 'complete, solve, create' and this is where the inspiration for the 6 Task Centers came about, allowing children to use their different skills. 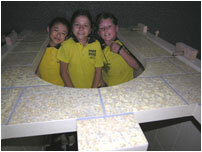 Taskworks was initially designed for schools, families and community groups. This has now been extended due to public request to include Birthday Parties. We hope that you - like us - are inspired to explore and join in your children's creative development.